I love Indian train travel. The journey itself is always an adventure, and if you’re in the right class, the ride is very comfortable. 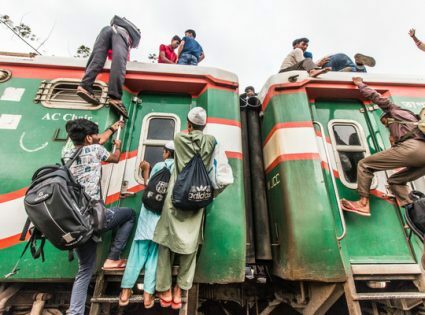 How many other countries would you visit just to ride the trains? Yes, seriously, it can be that good. But the process of booking fully-confirmed tickets can be daunting for newcomers. With such a complex ticketing system, it’s difficult to make sense of routes, scheduling, and availability. But never fear, we’ve put together a step-by-step guide to planning and booking Indian train tickets. All of these steps sound easy enough, but remember, this is India. When I booked tickets three weeks ago for our train trip next week, I was placed at number 18 on the waiting list. That means at least 18 people had to cancel for me to just get a seat, not even a sleeping berth. In my case, another 14 people had to cancel for me to go from ‘just a seat’ to a full sleeping berth. Complicated yet? There’s a bigger problem. If I’m in a group of people and we all start on the waiting list, there’s almost no chance that we’ll be sitting together because we’re automatically given whichever seat last canceled. We could be spread out all over the train, which is why it really pays to book ahead. What makes an ‘enjoyable’ train? The thing I loved most about our recent 12,000km circumnavigation of India by rail was hopping off the train in the middle of nowhere for a chai and a chat with the locals. You can actually have quite an interesting exchange with locals in only 10 minutes. Plus I loved trying the local food on the railway platforms. Some trains go an entire day with only a few 2-minute stops. Others stop 50 times a day. So I look for a train that has multiple 5-10+ minute stops during the day. A train with full meal service generally doesn’t stop as much and doesn’t give you as much opportunity to try the local platform food. Also, the aisle traffic increases dramatically with waiters running up and down the carriage constantly. Again, this is just my preference, but I really do prefer the slower trains that stop more often and leave the food up to you. As a general rule, any train named “Rajdhani” is a full meal service car. Rajdhanis are generally the fastest trains between two points and usually originate or terminate in Delhi. Most people I know prefer to travel by Rajdhani, but again, my personal preference is the less commercial option. If you’re like me, you don’t plan trips months ahead; at most a few weeks. Normally, that would give you plenty of time to arrange a train itinerary, but not in India. You may be put on a wait-list even if you book two months out. Say hello to the Foreign Tourist Quota (FTQ). That’s right, the kind folk at Indian Railways put aside a certain quota for foreign tourists. Don’t feel too special though, they also have a quota for females and a few other minorities. The FTQ doesn’t exist on all trains, but if you spend some time looking in the right place, you may strike gold. When you see the list of trains between two points, you should start by looking for the trains that run on the day you require. Even though you’ve chosen a date of departure, all trains between those points will show up. The date is used for the next step when you want to check for availability. This is where it all gets frustrating. You’ve spent hours planning an adventurous itinerary, but now you can’t find any availability. It’s best to start with your ideal train, check the general quota, then check the Foreign Tourist Quota (FTQ), and if that fails, find the next best train and check its availability. It’s easy to forget to check the FTQ, but as I just found, it is a goldmine of last minute availability. I actually spent 3 hours today in Bangalore cancelling all of our tickets and rebooking under the FTQ. And guess what, no more wait-lists; we’re confirmed on all trains and we’re only 3 days from departure. While finding availability is the tough part, booking the tickets is the frustrating part. The word ‘orderlycancelingexist when booking tickets at stations. To make sure you get a turn, you’ll firstly need to stand tall, exude some confidence, and maintain a wide berth to block people who try to push ahead of you. But if you’re already in India, you’ll know all about this, so I’ll get to the nitty gritty. To book Foreign Tourist Quota (FTQ) tickets, you must go to a station with a foreign ticketing window. Which stations have these windows? Your guess is as good as mine and my guess is as good as the official documentation, which is completely non-existant. Welcome to Indian train travel. You can book general quota tickets online, but my foreign credit cards won’t work on the official website, so there goes that idea. Plus most of my recent tickets are on the FTQ, so that’s no good anyway. You must fill out a reservation form before approaching the window. If you don’t, they’ll just make you do it at the window, which turns chaos into madness. It’s best to come prepared, so here’s the link to the online Indian train ticket reservation form that you can pre-fill and print to be fully prepared. Make sure your information is correct and don’t leave the ticket counter until you check every detail on every ticket. If you plan to cancel old tickets to book new tickets (maybe because you’ve found availability on the FTQ), you’ll need to fill out the same reservation form, but with the details of the tickets you plan to cancel. There are no fields indicating it’s a cancellation, so you can imagine how this can turn into a mess. Also, make sure you book your new tickets before cancelling the old tickets. Because if availability disappears, it may be best to hold you old tickets. But if you cancel the first, you can end up in a worse position. Don’t worry about the money difference, just ask the ticketing person to issue all of the new tickets and when they ask for the money, hand them the tickets to cancel to offset the cost. When you make a booking, you’re given a PNR number. You can use that on eRail.in to check the latest status of your ticket. This doesn’t matter too much if you’ve worked enough magic to find confirmed tickets, but it’s very important if you’re wait-listed. Why? Because if you don’t get off the wait list then you can’t get on the train. Lots of people will explain that there are many cancellations because they’re cheap. (The cancellation fee is only $1 to $2.) And that’s fine if you’re going solo, but if you’re a group, like I’ve mentioned before, it’s unlikely you’ll all get confirmed for seats or berths next to each other. And on a 40 hour train trip, that’s not so nice. But if you are in the unenviable wait-list position, it’s important to understand the numbering system. When you enter your PNR number into eRail.in, you may see something like WL30/WL20. That means that at its peak, the wait-list had 30 people on it. But now, your ticket is number 20. Only the second number will drop. Once you pass WL30/WL1, you may see something like WL30/RAC14. That means you now have a seat, but not necessarily a berth. You must go all the way from WL30/RAC 14 to WL30/RAC 1 before getting a confirmed berth. It’s actually more complicated than this, and there are many more variables, assumptions and exceptions, but they’re the basics.